The Egyptian prime minister's office has released the first photos from the Russian KGL-9268 crash that killed all of the 224 people on board when it crashed over the Sinai Peninsula on Saturday. 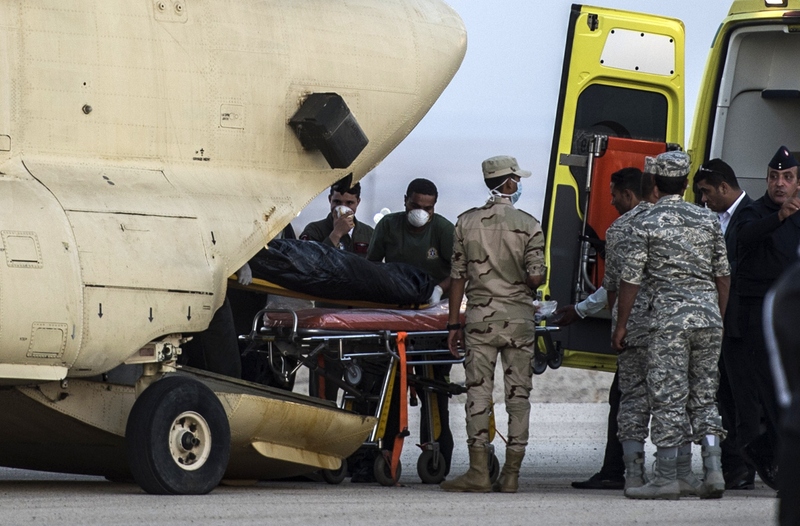 Egyptian Prime Minister Sherif Ismail visited the crash site in the mountainous Hasana area later that day, as crews are still working to recover bodies from the plane, which are being flown to a morgue in Cairo. The photos show the twisted wreckage of the plane, which split in two when it crashed into the ground. The back end of the plane, according to Al-Jazeera, smashed into a rock. Clothes are also scattered around the site. One official told the BBC that bodies were still left strapped in their seats. According to BuzzFeed, Ismail was accompanied by Egypt's tourism and health officials on his tour of the site. Search teams have already recovered the plane's black box, and are continuing to remove the bodies of the victims. Search teams are still recovering bodies from the scene. The initial search found bodies within a three-mile radius of the crash site, but officials are saying that the wreckage is spanned over a "vast" area. A security officer on the ground told Reuters: "A lot of the dead are on the ground, and many died whilst strapped to their seats. I now see a tragic scene." Although a group affiliated with ISIS initially claimed responsibility, Russian and Egyptian officials were both quick to dismiss the claims. That means that the black box could be essential in finding out what caused the crash. Weather conditions have already been ruled out as a possibility, and officials have said that they don't believe it was human error. According to Al-Jazeera, North Sinai security sources said the plane crashed because of a technical error, but it has not specified what kind. Although the possibility of terrorist activity has been all but debunked, other airlines are halting flights over the area until they discover the reason for the crash. The plane was making its way to St. Petersburg from a resort in Sharm el-Sheik when it crashed. Three Ukrainians, 214 Russians, and seven crew members were killed, including 17 children. As USA Today reports, it is believed to be the deadliest accident in the history of Russian aviation. The photos may not provide many answers, but it is a chilling reminder of the sheer magnitude of the accident.